2005: A brilliant combination, maple syrup and lime, a sort of sunlit sweetness. If you do the prep work ahead of time, reverse the order of preparation, that is, start the syrup and while it cooks, peel the carrots. 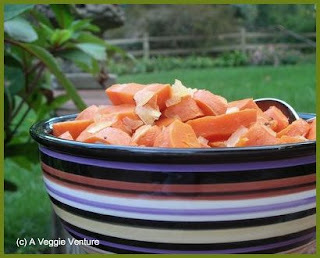 The uncooked carrots can sit in the saucepan, no water, for a couple of hours without harm until you're ready to cook. A light touch with the syrup is important. If it overcooks, as mine did tonight, the sugar will caramelize and turn into chunks of hard (and unusable) candy. 2007: This time, I used half the maple syrup, a good option for less sweetness. In a medium saucepan, bring to boil just enough water to cover carrots and salt on HIGH heat. Meanwhile, peel carrots, remove stem ends and tips, cut in 1/2 inch thick pieces on the diagonal. Add carrots to water, cover and return to boil. Reduce heat to MEDIUM and simmer until cooked, about 15 minutes. Drain. Add cooked carrots to skillet and turn gently to coat. Season to taste and serve. The bags of peeled carrots and the bags of frozen carrots simply yield no taste. If you don't have five minutes to peel fresh carrots, think about making something else. Contrary to what you'd think, Grade B maple syrup is more flavorful and coveted than Grade A.
I keep reading that "peeled carrots have no taste." Do you mean baby carrots have no taste? Thanks! Okay, so I could write a treatise on this subject! Baby carrots -- which aren't actually baby carrots at all, just machine-processed mega carrots cut into small bullets -- are just fine (and very convenient) when raw. But when cooked, they just yield no flavor at all. For cooking, you just really need to start with whole carrots. Peeling is optional -- I tend to peel them for a side vegetable but leave them unpeeled for stews, but that's just my taste. Also - if you can find small just-from-the-ground carrots at a farmers market, even Whole Foods, they taste completely different from the commercial carrots we buy at the supermarket. I think we've actually lost what real carrots taste like - not everyone likes these! Thanks, this makes a lot of sense. I've made baked carrot fries from normal carrots and I disliked them (despite loving other sorts of roasted vegetables) but I really liked the carrot fries I made with the multi-colored carrots. I scrub my carrots (usually with a drop of Seventh Generation Free & Clear dishwashing soap or a spritz of Fruit/Vegetable spray), but almost never peel them. I will be on the lookout for the tiny just-from-the-ground carrots! I like carrots that still have the tops, which I freeze to use when I make stock/broth. One more question: I was wondering whether there was a trick to printing your posts. I can't seem to print without all of the stuff on the right side. Thanks, Alanna! Is it 1 tablespoon each of zest and lime juice? Hi Anonymous - No, it's just the zest from a lime plus the juice from a lime which in my NON tropical environment means a lime that yields about a tablespoon of juice. I keep reading about limes which yield more and know they some times yield less so that's why I am specific. That said - this is a recipe where precision isn't paramount .